"Lost in Space Australia" (LISA is Australia's only fan club dedicated to the 1960's space adventure television show Lost in Space. Formed in 1992, LISA currently has about 550 members throughout Australia, Europe and the United States. The Club publishes a newsletter called "Alpha Control" approximately 2 times per year which contains over 60 pages of information, interviews, photos, reader's contributions and artwork. The results of a survey of members both here and overseas concluded that the club newsletter is held in very high regard by its readership as probably the most innovative and informative club fanzine about Lost in Space ever published. LISA holds about 2 meetings or conventions per year with attendance of up to 120 members and guests. Those in attendance can meet other members, swap information, photos, cards, memorabilia and the like. At the conventions there are talk and information panels, quizzes, competitions, special presentations and screenings of rare footage from the show, interviews with cast members, guest stars, people involved in production of the show and related material. Members of the committee managing the affairs of the club have close connections with the cast of the show and were able to arrange for a highly publicized and very successful tour of Australia by Jonathan Harris. Jonathan, who immortalized the role of the comedic villain Dr Zachary Smith, performed for packed houses his one man show at the Seymour Centre in Sydney. The Robinson Robot also joined him during his performance. LISA hopes that other cast members and perhaps even the whole cast will tour Australia soon. The announcement of the purchase of the rights to the Lost in Space motion picture by Turner Broadcasting has led to great expectations of an imminent blockbuster revival of Lost in Space on the big screen. Reference: LISA Press Release 1995. - Make all checks/postal/money orders payable to Lost in Space Australia in Australian funds. - Some back issues available. For more information write to Glenn Ware, the President, at the above address. Kyle Wood is a relative newcomer to the world of Lost in Space periodicals. 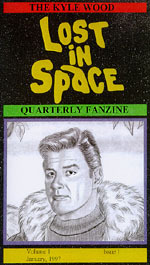 His quarterly fanzine premiered in January, 1997 with 40 pages of innovative Lost in Space material. 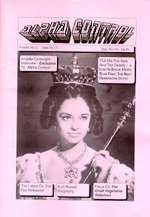 The fanzine includes trivia, childhood memories, convention coverage, collectibles and more. As you can see by the cover scan, Kyle also includes some of his own artwork in his zine. One thing that sets this fanzine apart from it's competition is it's use of color photography. Each issue contains both color and b&w photos! The Kyle Wood Lost in Space Quarterly Fanzine gives a refreshing new look to Lost in Space related fanzines. - Make all checks/postal/money orders payable to Kyle Wood in US funds. For more information write to Kyle Wood, the Editor, at the above address. Two newsletters published per year. Includes fan fiction, reviews, articles and wonderful artwork by Anna Dutto. The artwork is worth the subscription alone. Issues a Lost in Space newsletter on a quarterly basis. Includes a few paragraphs on the latest Lost in Space happenings and a list of items for sale. For more information write to David and Jenny at the above address. For more information write to Flint Mitchell at the above address. This organization owns many of the original Lost in Space props. They publish The Alpha Centaurian 3 times per year. Emphasis on technical aspects of Lost in Space as well as articles, trivia and collectibles. For more information write to Jeff Story at the above address.